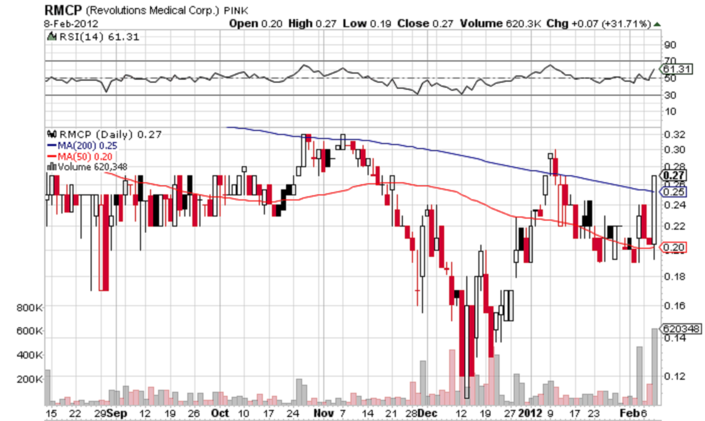 Revolutions Medical Corp. (PINK:RMCP, RMCP message board) bounced up again beyond the 200-day moving average on an even higher trading volume yesterday. After market close, the company filed a withdrawal of a previous registration statement for securities, which is likely to affect trading today. Yesterday's session closed at $0.27 for a share of RMCP common stock, which represents a 31.7% price increase from the previous day close. The stock recorded also the highest trading volume for the past six months as over 620,340 shares changed hands in a day. RMCP is now moving between its 50-day and 200-day moving average, however, no clear trend can be identified. 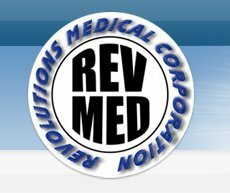 Later in the afternoon yesterday, Revolutions Medical submitted to the SEC a withdrawal of its Registration Statement filed in November last year. The original statement requested the registration of 10 million shares of the company's common stock that were issuable upon conversion of a promissory note in the amount of $1,050,000 issued to an accredited investor a year ago. On the one side, the news could be good as the shares may not be issued at this point, though the general cash position of RMCP looks very weak and its stock does not seem to deserve a higher price. In the last two reported quarters the company had no revenue whatsoever, and at the end of September it had $3,000 in cash against $1.9 million in current liabilities.